Buying a car is always a decision to be approached with care and research, but the market has changed since last time you were car shopping. Ask the right questions and thoughtfully find the right clean, green transportation. Take time to look clearly at why you need a car. How far do you drive in an average day? How often do you go long distances? How many people and what type of cargo do you typically carry? Seventy-eight percent of all Americans drive 20 miles or fewer to get to work. Fifty-one percent drive 10 miles or less. Do you fall within this range? Sometimes people own vehicles based on untrue assumptions. They drive a large pickup in case they need to haul things. Taking a close look, they may realize they only put things in the back a few times a year. Paying for delivery or renting a truck may have saved them money and emissions. Do you drive a 4×4 every day just in case it snows in the winter? Do you need three rows of seats or can you take two cars on the rare occasion you have extra passengers? Take a realistic audit of your driving habits and determine what you need. Where you live is a major factor, too. California, Oregon and the Northeast are way ahead of the rest of the country. 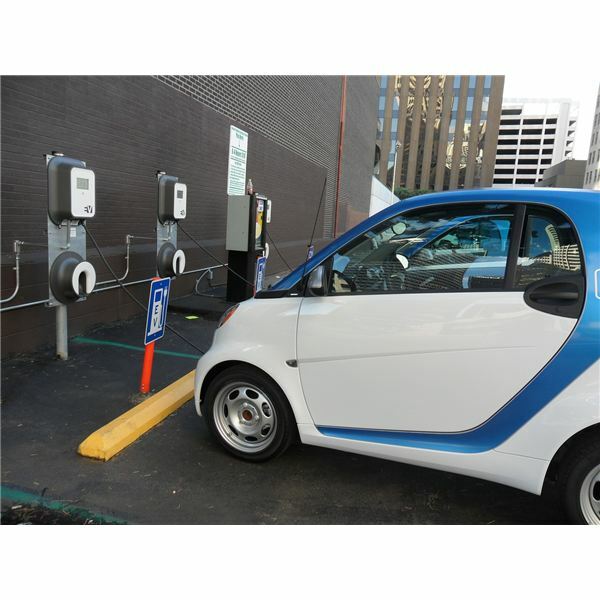 You can find more vehicles for sale, more charging stations and salespeople that are more knowledgeable. It may be worth a trip just to test drive and buy the right car. Compute your total monthly car spending cost. Add payments, insurance, fuel, maintenance and other expenses. Now, let’s see if we can lower that number. Your daily range will determine what sort of power train is right for you. In addition, how many vehicles do you own? Do you have a big vehicle for long family trips and another to take you around town? If so, your little car can have a shorter range. The average (non-Tesla) electric vehicle can go 70 to 80 miles on a charge. That range is lower for lead-footers. If you drive less than that almost every day, then an EV could be right for you. Plug it in at night and it will be charged in the morning. You’ll probably need to spend $600-700 to add charging equipment to your garage, but you will never buy gas again. If you can charge while you are working, then your range will be longer. Plug-in hybrids will go around 10-30 miles on electric power only. The new Chevy Volt leads the PHEV class with 50 miles. After that, the gas engine kicks in to charge the battery. You will still be getting better mileage than a pure gas car. The electric range will take you on your daily trips with little or no gas burned. When you need to take a long trip, your PHEV has the range to do it. This is a good choice if you only have one car. The Toyota Prius is the bestselling hybrid in the world, but many familiar vehicles are available as hybrid versions. If you don’t want to think about charging or change how you commute, a hybrid may get you up to 50 mpg. A hybrid family SUV will get your whole crew around and save money on gas. But do the math. You’ll spend more on a hybrid. Will it save you in the long run? Lease, Buy New or Buy Used? Look again at your total monthly car-spending figure. Then get some real numbers on some vehicles you are interested in. Considering fuel savings and tax incentives, will going green cost you more? Will you save money or break even? Do you have extra money to do the right thing for the environment? Buying a new green car can earn you up to $7500 in federal tax rebates. Your state may also give a tax credit or waive sales tax on your purchase. Leasing or buying used may not get you these benefits. Realize this very new technology is rapidly improving. Green cars are changing so much faster than traditional gas ones. You will have so many more choices in five years and the range should be considerably longer. So do you want to buy? When you pay off the loan, you could own a dinosaur. Leasing could be a more attractive choice that leaves you free to drive the newest and best in a few years. The choice is yours. Spending cash on a used car, owning it outright and not needing full coverage insurance is often a good idea. Yet green cars are so new to the market, not many used choices exist. In addition, the few used cars you find could be quite outdated because of how fast the segment is growing. There are a few wise choices for you. Hybrids are the most numerous. You can find a great number of Toyota Priuses dating all the way back to 1997. As they age, the batteries lose efficiency. An old Prius doesn’t get quite the mileage it did when it was new, but should still achieve at least 40 mpg. The battery warranties are fully transferable and last eight to ten years. Beware the first generation sold until 2003. They are slower, have few features and could be due for a $3000 battery replacement. The best choice is a three to four year old well-equipped third generation Prius. They have all the modern touches, plenty of warranty and sell for as low as $12,000. Plug-in hybrids are the newest green cars and you will find few used. High mileage 2012 Chevy Volts sell for around $15,000. Tests show that they are holding their range well and Volts with 100,000 still go 30 miles or more before burning gas. You won’t have many choices of used electrics either. If you like them small, you can buy a 2012 Mitsubishi i-MiEV for about $11,000. One of the worst vehicles for holding its value is the 2011 Nissan Leaf. It sold for $35,000 when new. Now Leafs with 30,000 miles sell for $11,000. What is bad for the seller could be good for the buyer. The price drop is based on consumer worry about the first model and battery problems a few Leafs had in Arizona. It turns out the batteries don’t like prolonged high heat. Those exposed to desert conditions lost 30% of their range in the first year, prompting Nissan to modify the warranty. Now Leaf owners will get new or reconditioned batteries if their range ever falls below 70% of original. You can get a steal on a used Leaf because of this. Just make sure it wasn’t owned in a hot climate. Insist on a long test drive. Take it 25 miles down the highway and back. In an hour, you should know the true range. Is it worth the risk or should you lease a new one? At least test-driving a car is free. Salespeople are always happy to tell you anything you want to know and let you investigate their inventory. Get to know a few hybrids and electrics. They may not be for you or you could get hooked. Burning less gas will be good for your planet. Buying less gas is good for your wallet. Research, look at your needs then make a smart choice.